2 Bedroom Flat For Sale in Manchester for Offers Over £100,000. A stunning spacious ground floor luxury apartment boasting space, two bedrooms and a high quality fitted kitchen and bathroom. Block 16 is enclosed with communal gardens in Larch Gardens which is within walking distance to the Manchester Fort retail park and easy access to the city centre. 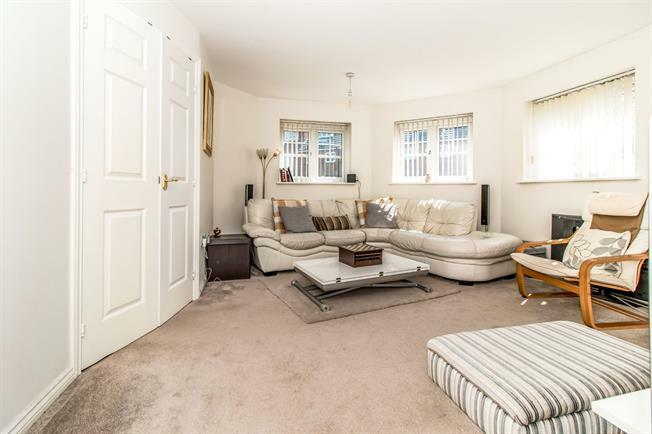 This ground floor apartment is immaculate and consisting of a carpeted hallway with storage to a huge hexagon shaped lounge with dual aspects. Double doors to a gloss fitted multi appliance kitchen. Two bedrooms, the main bedroom benefits from a fitted wardrobe. The bathroom is a great size with a three piece fitted suite in white. External gated entrance with communal gardens and an allocated car space. Wooden front . Electric heater, painted plaster ceiling, ceiling light. Double glazed uPVC window facing the rear. Electric heater, carpeted flooring, painted plaster ceiling, ceiling light. Double glazed uPVC window facing the side overlooking the garden. Tiled flooring, tiled splashbacks, painted plaster ceiling, ceiling light. Roll edge work surface, fitted and wall and base units, stainless steel sink and one and a half bowl sink, integrated, halogen hob, stainless steel extractor, space for washing machine. Double bedroom; double glazed uPVC window facing the rear. Electric heater, carpeted flooring, fitted wardrobes, ceiling light. Double glazed uPVC window facing the front overlooking the garden. Electric heater, carpeted flooring, painted plaster ceiling, ceiling light. Electric heater, tiled flooring, painted plaster ceiling, ceiling light. Low level WC, roll top bath with mixer tap, shower over bath, pedestal sink with mixer tap, extractor fan.